A buffet dinner must be a big eater’s favourite especially when the food is very fresh and tasty while having affordable price. Here in Gyu-kaku, the crews try to deliver those satisfactions to all the guests. Gyu-kaku Japanese Barbecue Restaurant serves Japanese barbecued meat with a hint of Korean taste and offers all-you-can-eat concepts with wide variety of ingredients. Guests are invited to be their own chef while grilling their own meats and vegetables on the Gyu-kaku’s special charcoal grill. In Indonesia, they already have two outlets. The first outlet is at AEON Mall Tangerang and they just recently opened the second outlet at Lippo Mal Puri Jakarta Barat. What becomes the core characteristic of Japanese barbecue is the wide variety of meat as Japanese tends to seek the natural taste of beef’s different parts. “The taste is developed by many aspects which one of it is its fat content. This is why Japanese enjoy includes many kind of beef on their barbecue. On the contrary, Korean barbecue does not really use many different parts of the beef and they mostly use pork,” said General Manager of Gyu-kaku Kota Shinozaki. Gyu-kaku Indonesia has 4 kinds of set menu which are differed by varieties of the meats. Every set menu has various appetizers such as cold tofu, kimuchi, sausages, and edamame; fried food such as gyoza, fried chicken, and chicken nugget; seafood such as scallop, shrimp, and squid; salads such as wakame salad, caesar salad, and sanchi wraps; vegetables to grill such as pumpkin, potato, and onion; various kinds of rice such as garlic rice and bibimbap; soup such as miso soup, tamago soup, and wakame soup; spicy or non-spicy gomanegi ramen; and desserts such as gyukaku ice cream and signature milk pudding. First time we see the menu, we will find that the price is quite high for a restaurant in a shopping mall. However, what diners will get makes the price worth it especially if they are big eaters. Chicken Buffet consists of chicken thighs, chicken breasts, chicken wings, and cheese fondue chicken. It is priced at Rp 158,000 for adult and Rp98,000 for senior/kids. Selected Beef Buffet consists of chicken thighs, chicken breasts, chicken wings, cheese fondue chicken, beef tongue, and karubi. It is priced at Rp 198,000 for adult and Rp128,000 for senior/kids. Standard Beef Buffet consists of chicken thighs, chicken breasts, chicken wings, cheese fondue chicken, karubi, and sirloin. It is priced at Rp 278,000 for adult and Rp198,000 for senior/kids. Premium Beef Buffet consists of chicken thighs, chicken breasts, chicken wings, cheese fondue chicken, karubi, sirloin, Australian wagyu, and Gyu-kaku’s special karubi. It is priced at Rp 398,000 for adult and Rp298,000 for senior/kids. What makes them affordable is that Gyu-kaku is focused on food handling and trained employees rather than expensive ingredients. “What makes the beef taste delicious is not only depends on quality the beef, but also on the handling. It includes how we cut the meet, keeping it, putting in the chiller, freeze it, and serve it,” said Kota. Besides investing on the trained human resources, raising brand awareness becomes the ultimate trick on suppressing the price. At Japan, Gyu-kaku already has more than 600 outlets that make them one of the biggest yakiniku restaurants there. “This enables us to have more bargaining power and can deal better with our supplier in order to get ingredients with lower price. We will imply this in Indonesia by opening eight outlets this year to raise more brand awareness,” said Kota. Besides the tasty beef, what makes Gyu-Kaku unique is how they combine Japanese way of eat and Korean taste. 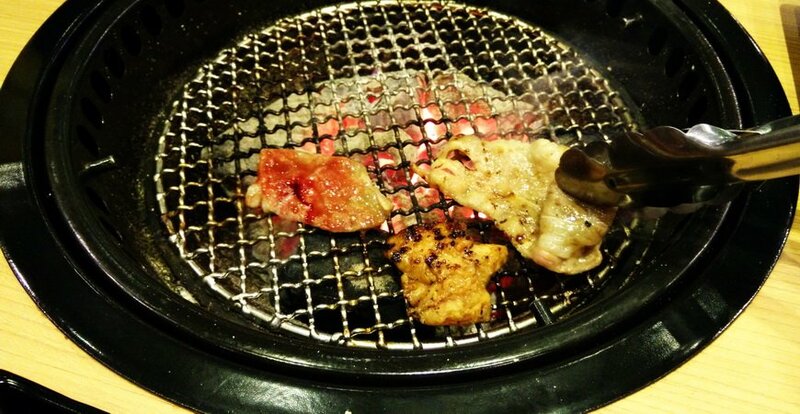 “At first, it is actually Korean who introduced Japan of barbecuing meat. However, we Japanese then adjusted the barbecue with our flavour,” said Kota. The first thing you notice when you eat at Gyu-Kaku is the using of Kimchi of Kimuchi as appetizer. After that, we can sense the subtle taste of sweet, spicy, tangy Gochujang on the beef. “For chicken, we marinate it with miso sauce so that it has salty and savoury flavour as for beef, we need to give sweeter and tangier flavour that screams barbecue. For that reason, we use tare sauce made from gochujang, miso, and fruits,” said Kota. Gyu-kaku also includes the famous Korean sanchu ssam or wrap, which is wrapping the barbecued meat and other ingredients with lettuce before eating it, as an eating option. Customers may ask a plate of fresh lettuce when they eat. With 126 seating capacity, Gyu-kaku strives to popularize the way of eating barbecued all-you-can-eat beef accompanied with many fresh ingredients. This attempt is also helped with the fact that they choose strategic locations at famous shopping mall such as here at Lippo Mall Puri. Asked about the next plan for Gyu-kaku, Kota said that there are many lorm-term plans for this restaurant. “We want to bring Japanese wagyu also as it has more beautiful marbling on the meat. We expect to open standing restaurants for the next years as well. In order to do that, we will work hard make Gyu-kaku a highly well-known yakiniku restaurants in Indonesia,” said Kota.